On the MTTS podcast, we’re debuting a brand-new segment, called “How’d You Write That?” and it should be fairly obvious what it’s all about. Our first guest happens to be an excellent one, ESPN the Magazine’s Kevin Van Valkenburg. Before you listen, make sure to read last month’s feature on Adam Muema, “Hiding in Plain Sight.” In our chat, we discuss how Van Valkenburg got in touch with the elusive Muema in the first place, why he structured the story the way he did, whether he ever felt Muema was manipulating him, and how he handled a competing outlet trying to write the same story. Before we get to Van Valkenburg’s interview, we remember the career of longtime LA Times columnist T.J. Simers, who announced his retirement from the Orange County Register (and from sports writing as a whole) this past week. One of my favorite portions of Episode 15 is Simers talking about how he created his own little world in the columns he wrote, and I’ve included a snippet of it in this week’s episode. 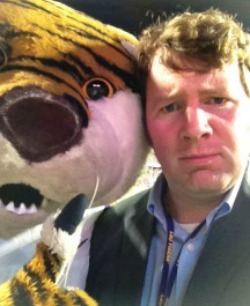 Last week, Mark Sheldon was the most famous sports writer in the land. Mostly because San Francisco Giants infielder Pablo Sandoval’s foul ball destroyed Sheldon’s computer (the photo above was screen-shot about 20 seconds after the destruction) while local TV produced a video on Sheldon’s reaction that quickly went viral. But Sheldon, who I’ve known since last decade, is a good sport, and he agreed to talk about some of the most infamous moments of his career. In our chat, we discuss what the hell happened in that moment and why it came at such a bad time, how he still managed to write and send in his final game story of the night, and what kind of reaction he received in the aftermath. Plus, we talk about what he thought about two-time MTTS guest C. Trent Rosecrans jubilantly taking photos of the destruction in the seconds after the ball entered the press box and if Sheldon ever talked with Sandoval about the incident. Also, whatever happened to that foul ball of destiny. Glenn Sample was usually the first to arrive. He’d pull into the parking lot at McDonald’s around 9 a.m. most every Wednesday, enter the eatery, stride to the counter, throw a smile at a cashier here and an employee mopping the floor there, and order his coffee. Then, he’d sit down, sip his java and wait for his friends – the members of his extended UC family – to arrive. They’d straggle in, order their own shots of morning caffeine and begin telling the stories they’d described in the same way for the past 60 years. Every week, at this McDonald’s just off Interstate 75, the old-timers would come together. They’d Mc-rib each other, laugh at the stories they’d heard a million times, discuss what so-and-so was up to these days. Every Wednesday, it was like this. One sunny day in September 2008, Sample, like usual, arrived early, grabbed his coffee and sat at a booth by the side entrance. Soon, Ray Penno joined him. Bill Williams walked through the door, and Dean Giacometti sauntered in as well. The weekly meeting had commenced. The caffeine entered their bloodstreams, and the stories began to flow. They started with one of their favorites. Instantly, they returned to the day, sixty years earlier, of the Walnut Hills-Western Hills football game when the two teams battled for the city championship of the Public High School League. Sample and Don Zimmer – who went on to big success in professional baseball – were playing for Western Hills, and Giacometti, who had played at UC from 1939-41 before entering World War II, had taken a job as an assistant coach at Walnut Hills. Walnut Hills had never won the city title, but with less than a minute to play, Giacometti’s team held a 7-6 lead on the water-logged field. Zimmer, the Western Hills quarterback, faced a fourth and 11 from the Walnut Hills 20-yard line. All night long, Walnut Hills had contained Zimmer in Western Hills’ single-wing offense, and Zimmer needed a miracle to gut out this victory. On the final play of the game, with the center Sample leading the way and blocking every Walnut Hills defender in sight, Zimmer escaped traffic, went around the end of the line and raced for the end zone. He didn’t make it, falling three yards short of the goal-line. And six decades later, Giacometti’s frustration with what happened next still is evident. The officials signaled touchdown, and in doing so, denied Walnut Hills the championship. To this day, Giacometti swears Zimmer’s knee was on the ground, the play was over and that Walnut Hills should have won the game. Sample corrects him: Zimmer’s hand was down, not his knee. Big difference. Giacometti’s counter: he has a video tape of the play, which proves Zimmer had been tackled and that Walnut Hills had been robbed. Curiously, Giacometti never remembered to bring the video for these weekly McDonald’s meetings. Giacometti smiled. He sensed that one day the truth would be unveiled, and if he’s waited sixty years, he can wait a little while longer. And with that, the old-timers were onto another story from long times gone. Those former players remained true to each other, as well. They kept in touch with each other, they considered themselves brothers and, every Wednesday at 9 a.m., a group of them met at a local McDonald’s to rehash the past sixty years. Until, that is, the day in November 2008 when Sample – who had just returned home from a speaking engagement in Dayton – died of a heart attack at his home. Although he was 77 years old, it was a shock. He was in such great shape and in such great spirits that his death left his colleagues in disbelief. A few weeks later, UC held a memorial service for him at Fifth Third Arena. Hundreds of people gathered inside and watched as pictures of Sample’s life flashed across the scoreboard. One of him and his grandkids at the Grand Ole Opry, one of him and Pete Rose, one of him with Lana Turner, one of him and his classmates with Clark Gable. His distraught son, Jeff, played a musical tribute, and more than a dozen of his colleagues and former players offered their eulogies. Dean Giacometti rose from his seat, walked to the microphone, and not surprisingly, told the story about Don Zimmer and the Walnut Hills-Western Hills city championship football game that had been decided by Zimmer’s supposed touchdown. 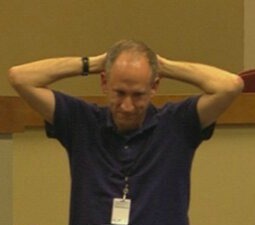 He repeated that he just couldn’t believe Zimmer had scored legitimately. After all these years, didn’t Zimmer have something to confess? “Well, maybe I slid into the end zone,” Zimmer said. Then, he came clean with the truth. “Coach, we were lucky,” Zimmer admitted. “You had a bad call.” Giacometti, smiling, sat down with a satisfied look on his face. He had known all along, and finally, he had been vindicated. Sample would have laughed hardest at that. Many people who I meet think sports writers have the coolest job in the world, and while it’s hard to disagree at times, I think I’ve found a job that’s even more fanastic. 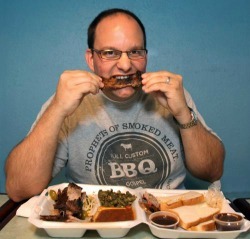 Meet Daniel Vaughn, the BBQ editor for Texas Monthly magazine. As far as we know, he’s the only BBQ editor in the country, and yes, he gets to eat a half-ton of BBQ and then write about it. In our chat, we explore the ideas that he forever might have ruined his palate for mediocre BBQ, why you should be the first enchilada expert rather than the next BBQ expert, and if this massive interest in BBQ — call it a BBQ bubble — will decline at some point. Plus, we talk about his journalistic ethics in a field where it’d be real easy to eat a ton-and-a-half of free meals, and how Vaughn stays healthy despite eating so much smoked meat. In Episode 9, we talked to my favorite Australian BBQ writer, Jess Pryles. My first live #MTTS interview and one of my favorites. You can listen to that here.